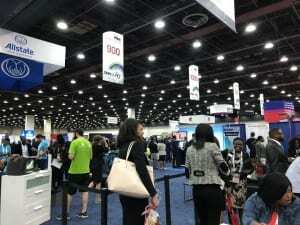 As an international student, I was doubly stressed because it was a completely new way of recruiting for me and majority of the companies at the Conference were not sponsoring visas for International students. Moreover, I also got to know some of my classmates better than before in the process of riding with them to Detroit and sharing an Airbnb with them! Recruiters are also people! Take the time to ask them about their day before rambling on your elevator pitch. Meet people from other schools and build connections while waiting in long lines. Keep some snacks and a small bottle of water on you. Ladies, wear flats or comfortable heels – because you are going to be on your feet all day. Enthusiasm may go down on Day-2 if you don’t have an interview. Decide whether you really need to stay or not. I happened to stay and talk to some really cool companies on Day 2! Especially for international students (like me) : Set your expectations straight and everything will seem a lot better. Keep your eyes and ears open – observe how others are speaking and learn from them. Not getting an offer or an interview can be disappointing but do not forget it’s your experience that matters. 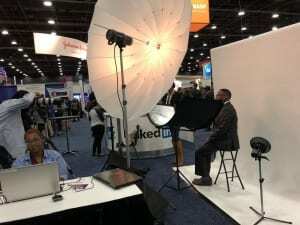 Finally, make the most of your time there: I collected lots of ‘swag’ ( free goodies from companies), clicked a professional photo at the LinkedIn booth (for free), and also toyed with Microsoft Hololens which was on display! One of my classmates also won an Xbox! Finally, I believe this conference was just one of the many beginnings of my recruiting experience at Tepper and it has prepared me well for future opportunities.